LG today announced an "LG G6 Second Year Promise" program, which extends the G6's limited warranty from 1 year to 2 years. 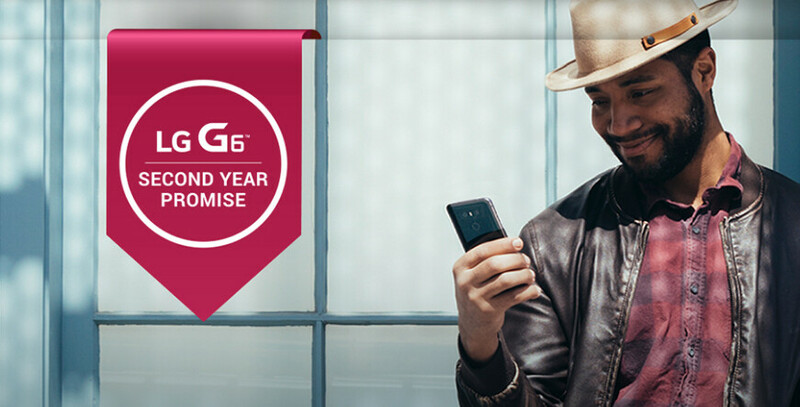 The program is available only in the US, includes all G6 smartphones purchased from any mobile carrier or authorized retailer, and requires registration on LG's official website. If you've bought your G6 before today (June 15, 2017), you'll have to register within 12 months of purchase, and provide a proof of purchase, plus your phone's IMEI/MEID and serial number. If you're getting an LG G6 today, or after today, you'll have to register within 90 days of purchase. Registrations can be made via a special LG web page that's online as of today - see the first source link below. If you register for LG's new program, you'll be "entitled to a free replacement of a qualified LG G6 which fails due to manufacturer defect in material or workmanship." In other words, if your G6 gets damaged and it's not your fault (as in: you didn't drop it or anything like that), LG should replace the phone for free - "within two business days." Usually, smartphones come with 1 year limited warranties in the US, so it's obviously nice to see that LG is offering an extra year of warranty - for free - to G6 owners. This is great! If this also applies to the upcoming V30, I would be more confident of getting it! LG = Low Grade. Why 1 extra year , they'll give 3 years extra also , nobody is buying LG junk phones anyway. Phonehex..............shut up please. Don't be a pathetic troll. Every brand is good in someway. Highlight the positive to spread the good things for everyone. Otherwise stay shut. Would be a favour on us. AmashAziz , brands will be good and bad but some countries will never change from being the scum of the planet. No, racists like you are the real scums. HTC and Foxconn (which makes Apple) are Taiwanese, LG & Samsung are South Korean, both seem like fairly decent countries. Aside from being a pathetic troll, your identity also screams 'racist'. Why do you care Amash? How's Karachi treating you? All good and happy? Lots of peace around you? Only USA? Why LG Why! Because in EU 2y warranty is mandatory so we already have that. They've reduced the prices insanely in other countries. That's why. Cheaper day by day. If I was LG, I would expand this Benefit to other Markets, it will capture people's attention and will gradually gravitate towards LG's products, because who doesn't love extended warranty? I feel LG is making a mistake by having this be a US Exclusive. The US isn't the only Vital Market. Yes!! I just bought 2 last month. Post 5 Guess you have stock in LG also LMAO just like you do in apple. Anyway, to the article, I do agree, LG should extend the warranty for everyone not just the US. They want to pick up market shares that's not the way to do it. If I could I would, but they are a Korean company. I had my g4 bootloop on me. returned it, added a bit more, got the v20. whata fpukin monster phone. it has it all. and swapping a battery on the fly thats slim and sits in my wallet is a huge plus. my phone nevers connected to a cable. I just have 2 extra batteries in cradles charging and swap. I go from 10% to 100% in 1 minute. so even after the bootloop Im still an lg fan. I think theyll pay a large sum of money for restitution to others but I doubt the g6/v20 and anything forward will bootloop again. just like samsung learned their lesson with the note 7 battery. Well, in Europe the warranty is already 2 years. Mandatory as per EU regulations. This is probably a gesture to counter the bootloop issues with several generations of their phones that led to a class action lawsuit filed against them. That's good. Should had this on V20. Very fragile phone. Co workers camera lens crack while inside his pocket. I have two V20s for like six months now and dropped it on concrete like 4 times with each phone. The glass did not break or scratch at all. I wouldn't call it fragile.